jeropbrenda updated the task description for T218046: Proposal: Documentation improvements to the ~20 top 70 most-viewed MediaWiki Action API pages, Outreachy Round 18.
jeropbrenda committed rESHH952a461cc172: Convert mediawiki.org links from http to https (authored by jeropbrenda). jeropbrenda committed rLTASfd99f9f7fb8a: [IMPR] Add unit tests for the awmd-stats tool (authored by jeropbrenda). jeropbrenda committed rLTAScbbfefdd70fc: [IMPR] Add unit tests for the awmd-stats tool (authored by jeropbrenda). jeropbrenda committed rEMMSe5467e74e868: Empty PHP entrypoint in extension MetaMaster (authored by jeropbrenda). jeropbrenda committed rEMMSa34751578af4: Empty PHP entrypoint in extension MathSearch (authored by jeropbrenda). jeropbrenda committed rEMMSc20dd706a98c: Empty PHP entrypoint in extension MetaMaster (authored by jeropbrenda). jeropbrenda updated the task description for T145376: Create documentation for addwiki library features. jeropbrenda added a comment to T205450: [Recurring] Unit tests for the awmd-stats tool. jeropbrenda committed rLTAS988a656c0947: [IMPR] Add unit tests for the awmd-stats tool (authored by jeropbrenda). jeropbrenda committed rLTAS7723fc512c3f: [IMPR] Add unit tests for the awmd-stats tool (authored by jeropbrenda). jeropbrenda committed rLTAS7a2730584c48: [IMPR] Add unit tests for the awmd-stats tool (authored by jeropbrenda). jeropbrenda added a comment to T213581: Africa Wikimedia Developers Leader Board Monthly Statistics for the year 2019.
jeropbrenda awarded T213581: Africa Wikimedia Developers Leader Board Monthly Statistics for the year 2019 a Love token. @D3r1ck01 For March, it looks like @Didicodes has more patches? jeropbrenda closed T186581: [mediawiki-api] Add method to PageListGetter to get list of outgoing links from a page as Resolved. jeropbrenda added a member for Addwiki: jeropbrenda. jeropbrenda added a member for patch-welcome: jeropbrenda. jeropbrenda claimed T84977: API: Purpose of "batchcomplete" property and implementation. 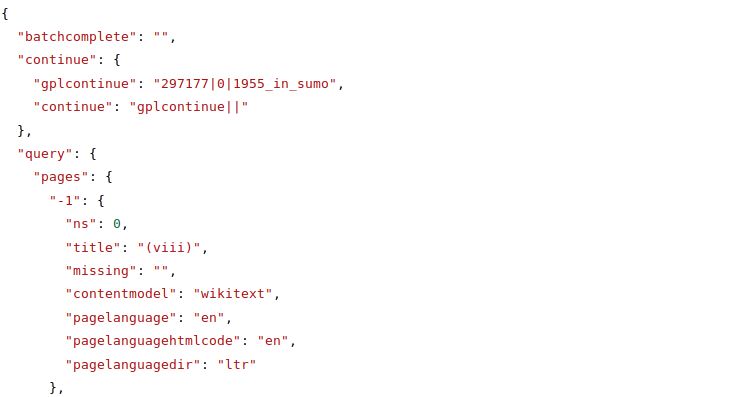 jeropbrenda claimed T186581: [mediawiki-api] Add method to PageListGetter to get list of outgoing links from a page. jeropbrenda closed T195271: Help:Merge history is next to useless as Resolved. jeropbrenda added a comment to T84977: API: Purpose of "batchcomplete" property and implementation. I think intended use of batchcomplete makes sense now. But it still seems confusing to me on write-requests where the client cannot "continue" even if they wanted to. As such, it seems the only purpose of batchcomplete on action=watch is to tell you whether or not you got all the information you asked for. However, when the answer is no, you don't have continue-based method of getting the remaining information. Is that right? jeropbrenda claimed T218046: Proposal: Documentation improvements to the ~20 top 70 most-viewed MediaWiki Action API pages, Outreachy Round 18.
jeropbrenda moved T218046: Proposal: Documentation improvements to the ~20 top 70 most-viewed MediaWiki Action API pages, Outreachy Round 18 from Proposals in Progress to Proposals Submitted on the Outreachy (Round 18) board. jeropbrenda added a comment to T195271: Help:Merge history is next to useless. @Aklapper I have added the usage instructions to the help page and it has been marked for translation. I think this can be marked as resolved now? jeropbrenda updated subscribers of T218046: Proposal: Documentation improvements to the ~20 top 70 most-viewed MediaWiki Action API pages, Outreachy Round 18. @Dinoguy1000 I have added a little more detail to the page. @Anomie I have added an example here to expand on the existing explanation. jeropbrenda added a comment to T186581: [mediawiki-api] Add method to PageListGetter to get list of outgoing links from a page. Yes, using the title would work because all pages have one. Would assigning negative pageids to pages with missing:"" be a dirty workaround? I get it now. Yes, the response can be represented as a Pages object for existing pages. For non-existent pages, missing: "" is returned instead of a pageid. Do you want non-existent pages to be included in the output? jeropbrenda committed rEATH687714757486: Add license information for Extension:Athena (authored by jeropbrenda). jeropbrenda committed rEMDOa8cea42198a0: Add license information for Extension:MintyDocs (authored by jeropbrenda). jeropbrenda committed rEARA076d3da6b5b2: Add license information for Extension:ArticleRatings (authored by jeropbrenda). @Aklapper Thanks for the reply! Yes, I've written and tested the code on my local copy of the repo, and it produced the expected output, which @Samwilson said wouldn't be possible with API:Links. So I was just sending the output of a simple GET request for confirmation in case I missed something. @Samwilson @Addshore I'm a new contributor who's interested in working on this:). I tried using API:Links and it does return page IDs. Maybe I don't understand what's required? jeropbrenda committed rEATH6f7b6f0f7be3: Add license information (authored by jeropbrenda). jeropbrenda committed rEMDO5954ac05974a: Add license information (authored by jeropbrenda). jeropbrenda committed rEARA1e8e705a7f21: Add license information (authored by jeropbrenda). jeropbrenda added a member for good first bug: jeropbrenda. 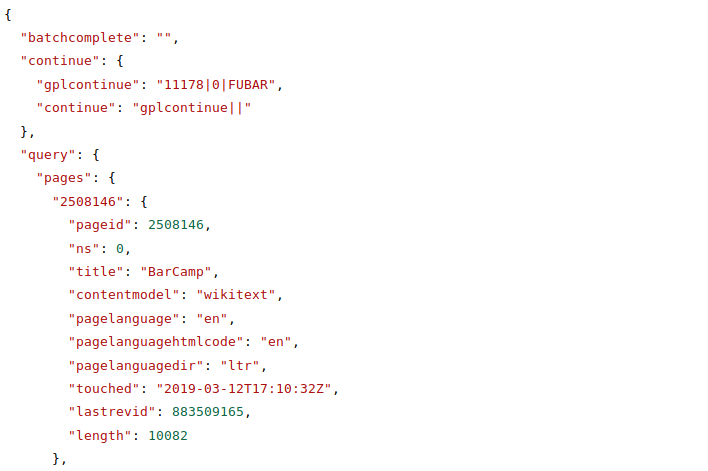 jeropbrenda added a comment to T123943: Add extension licenses to extension.json so they appear correctly on Special:Version. Contributors is missing a LICENSE or COPYING file but the license information is provided on its wiki page Extension:Contributors. Should I add the COPYING file too or just the missing license-name line? Mill <mill@mail.com> committed rLTAS70691c45a19a: edaaaaaaaaaaaa (authored by jeropbrenda). jeropbrenda committed rLTASe8e3975e2e0e: [IMPR] Add unit tests for the awmd-stats tool (authored by jeropbrenda). jeropbrenda committed rLTAS553aabf8f8c9: [IMPR] Add unit tests for the awmd-stats tool (authored by jeropbrenda). @Dinoguy1000 I have made a draft for the usage instructions in my sandbox here. Please have a look. jeropbrenda claimed T195271: Help:Merge history is next to useless. jeropbrenda moved T218046: Proposal: Documentation improvements to the ~20 top 70 most-viewed MediaWiki Action API pages, Outreachy Round 18 from Proposals Submitted to Proposals in Progress on the Outreachy (Round 18) board. jeropbrenda added a comment to T218046: Proposal: Documentation improvements to the ~20 top 70 most-viewed MediaWiki Action API pages, Outreachy Round 18. @srishakatux Thank you so much for the feedback! jeropbrenda committed rLTAS49939d7b43bf: [IMPR] Add unit tests for the awmd-stats tool (authored by jeropbrenda). jeropbrenda committed rLTASaa4284090546: Add unit tests for the awmd-stats tool (authored by jeropbrenda). jeropbrenda committed rLTASd71724344ea3: Add unit tests for the awmd-stats tool (authored by jeropbrenda). jeropbrenda committed rLTASfffeac56058b: Add my name to contributors.json (authored by jeropbrenda). jeropbrenda removed a watcher for Africa-Wikimedia-Developers: jeropbrenda. jeropbrenda added a member for Africa-Wikimedia-Developers: jeropbrenda. jeropbrenda renamed T218046: Proposal: Documentation improvements to the ~20 top 70 most-viewed MediaWiki Action API pages, Outreachy Round 18 from Proposal: Documentation improvements to the ~20 top 70 most viewed MediaWiki Action API pages on-wiki- Outreachy Round 18 to Proposal: Documentation improvements to the ~20 top 70 most-viewed MediaWiki Action API pages, Outreachy Round 18.
jeropbrenda removed a watcher for Outreachy (Round 18): jeropbrenda. jeropbrenda claimed T139567: API action=parse&prop=headhtml returns more than just the <head> element: Fix documentation. jeropbrenda claimed T186573: Add information about hidden fields (e.g., userhidden, commenthidden, sha1hidden, etc.) to api.php documentation. jeropbrenda added a comment to T120366: Add documentation to most used undocumented pages on Commons. jeropbrenda added a comment to T108980: Write help page for using citoid in VisualEditor. jeropbrenda updated the task description for T201491: Fix common typos in code. jeropbrenda added a comment to T215682: Outreachy Round 18: Documentation improvements to the ~20 top 70 most viewed MediaWiki Action API pages on-wiki. jeropbrenda renamed T218046: Proposal: Documentation improvements to the ~20 top 70 most-viewed MediaWiki Action API pages, Outreachy Round 18 from Outreachy Round 18: Documentation improvements to the ~20 top 70 most viewed MediaWiki Action API pages on-wiki to Proposal: Documentation improvements to the ~20 top 70 most viewed MediaWiki Action API pages on-wiki- Outreachy Round 18.
jeropbrenda renamed T218046: Proposal: Documentation improvements to the ~20 top 70 most-viewed MediaWiki Action API pages, Outreachy Round 18 from Outreachy Round 18: Documentation improvements to the ~20 top 70 most viewed MediaWiki Action API pages on-wikirt project title here to Outreachy Round 18: Documentation improvements to the ~20 top 70 most viewed MediaWiki Action API pages on-wiki. jeropbrenda renamed T218046: Proposal: Documentation improvements to the ~20 top 70 most-viewed MediaWiki Action API pages, Outreachy Round 18 from Oeutreachy Round 18: Documentation improvements to the ~20 top 70 most viewed MediaWiki Action API pages on-wikirt project title here to Outreachy Round 18: Documentation improvements to the ~20 top 70 most viewed MediaWiki Action API pages on-wikirt project title here.